Atheer’s days are long, but he’s grateful for his hours learning at WorkWell. Photo by Erin Wilson/Preemptive Love Coalition. 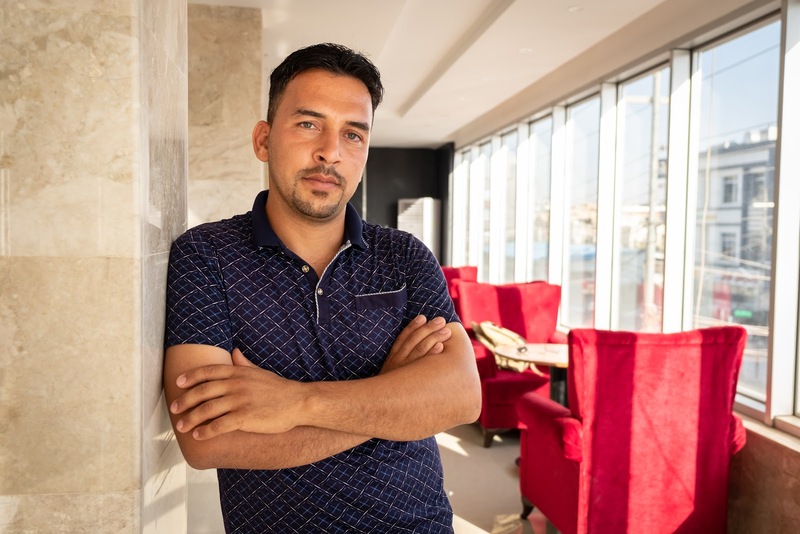 Atheer was with a big group of friends—all displaced Iraqis, forced to flee home by ISIS and now living in a camp in northern Iraq—when one of them went around the circle and asked what each one wished for. Some guys wished for money. Some wished they could leave Iraq and go to Germany. One wished that the problems in Iraq would be over. Atheer was last to answer. When it was finally his turn to speak, he said he wished to be fluent in English. His friends called him out. It seemed too small a wish, too strange. But Atheer explained that if he was fluent in English, he could work anywhere. He’s not looking for handouts. He’s not looking for anyone to take his problems away. He most wants the tools in his own hands to build a good life. And through WorkWell, our tech hub for refugees and vulnerable young people in Iraq, you’re helping Atheer’s wish to come true. Every session at WorkWell—our tech space where young men and women impacted by war in Syria and Iraq learn high-demand skills, collaborate, receive coaching, and gain access to the global digital marketplace—begins with intensive classes in English. Fluency in English is essential for fluency in the tech market. Fluency in English opens up infinite doors to web-based freelance work beyond the borders of Iraq and Syria. It’s a valuable skill, and our students know it. Spending some time with Atheer, his classmates seen behind. Photo by Erin Wilson/Preemptive Love Coalition. When Atheer enrolled in WorkWell, he had few skills helpful for a job in tech. Before he fled ISIS, he worked the land north of Baghdad. He knows the language of a farmer, soil and weather, seeds and harvests. Atheer never gave much thought to the world of tech. But it’s hard to be a farmer in Iraq these days. War has left the soil sown with explosive devices. Water projects in countries upstream from Iraq—in Turkey and Iran—have seriously reduced the amount of water available for irrigation. And it’s impossible to farm the land when you don’t know when you’ll be able to return home. Atheer is making full use of this opportunity. In the displacement camp where he lives, he works delivering water to more than 2,000 resident families. From 4:30–11:30 a.m., and then again from 6:45–11:00 p.m., seven days a week, Atheer makes sure that his neighbors get the water they need. In the hours in between, Sunday to Thursday, Atheer is at WorkWell. From his very first classes, Atheer was determined to make the most of this chance. He asked his teachers for extra homework, and for advice on how to learn more. He practices English by speaking to himself, even if it looks crazy. He practices saying phrases over and over again until the words come naturally. When he got the chance to make a presentation at a weekly assembly, Atheer worked for days to prepare a presentation about the value of being a humble person. It was a good topic choice—he already lives it out. Atheer’s time at WorkWell is wrapping up, and he was quick to express how much he has loved it. As we’ve heard from other students, when Atheer is at WorkWell, for a few hours every day, all of his problems disappear. His mind is so busy with learning, there is no room left for worry. No matter what he is doing after WorkWell, whether delivering water at the displacement camp or using his new skills for freelance work, Atheer will continue to study English, practicing his phrases over and over, until his wish comes true. Donate now and ignite the dreams of Syrian and Iraqi refugees.